Last week in Love’s Labor: Part One, we learned that Faye Bennett’s interest in Brian Lambert, one of her brother Wil’s best friends, is reciprocated. That’s a happy circumstance for Faye and Brian. But what’s happened to the great friendship between Faye and Suzanna Owens now that Faye finds herself in the midst of her first love? It must be Thursday and time for another edition of the Carding Chronicles. So read on, enjoy, and then please do your part to boost tourism in Carding by sharing this story with your friends. Thanks! 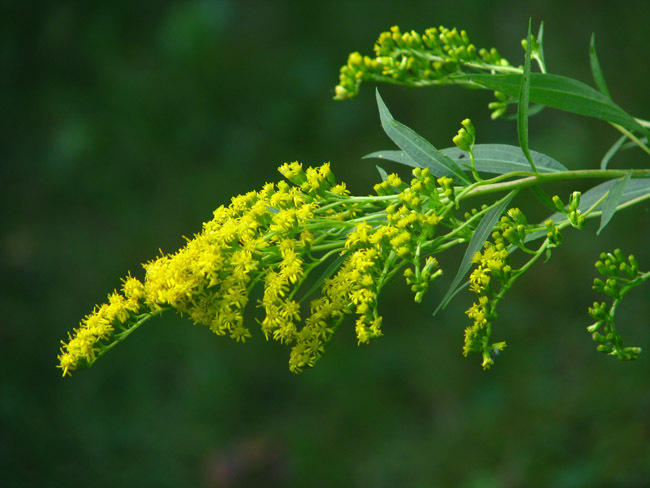 Botanists estimate there are 140 species of solidago, or what we call goldenrod, in the world. Many of them have settled in New England. This gorgeous yellow-flowered plant covers our open fields, lines our roadways and paths, and gives bees something to do right into some of the last days of fall. In Carding, every teacher and school kid watches for the first appearance of goldenrod (the earliest varieties bloom the first week of August) because that means the period of summer dormancy is drawing to a close, and the flyers in the newspapers are screaming about “Back to School” sales. So it’s not unusual to see the energy at the town beach pick up, the number of local hikers on the Appalachian Trail grow, and the carnival rides get crowded at the local fairs. It seems like everyone’s trying to cram as many moments at they can of summer’s freedom into the time left before heading back to school. Ruth Goodwin, Carding’s mail carrier and woman-about-town, knows that as well as anyone. As she makes her rounds, she sees folks scrambling to finish the paint job on the garage, get wood stacked, and hustle down to the river to catch some of the bass and trout that have been fattening up since April. So she didn’t understand why Suzanna Owens was spending a fine sunny day in the post office helping her Uncle Ted sort mail. Suzanna, all of fifteen but looking like more like twelve, could be a skittish kid, often not responding to direct offers of kindness. Given the girl’s background—a derelict mother, an early life of random moves, sketchy schooling, and periods of abandonment—Ruth could easily understand that. But that didn’t explain the girl’s presence in the post office. “Hey Suzanna, nice to see ya,” Ruth ventured. Ted looked up from the pile of junk mail in his hands, relief clearly visible in his eyes. “Yeah. Hey Ruth,” the girl sighed, and Ruth caught the sound of tears in her voice. “Have you been waiting for me?” she asked. “Well, I figured you might be needing a ride up to the Tennyson farm,” Ruth said. Suzanna swiveled her eyes toward her uncle, looking for guidance. Suzanna dropped the pile of mail she was pretending to sort, jammed her hands into the pockets of her jeans, mumbled “Yeah, okay. I’ll go,” and scuffed her feet all the way out to Ruth’s Jeep. As she turned to follow the girl, Ruth made the universal sign of “telephone call” to Ted while pointing in the general direction of the Tennyson farm. Ted nodded, and slid his cell phone out of his pocket. No matter how hard Ruth tried to pry more than single word answers out of Suzanna, the girl stayed resolutely unresponsive, her eyes averted, her head bobbing in time to the dips and sways of the dirt road that led up to the Tennysons’ hundred-acre spread at the top of Belmont Hill. About halfway to the farm, Ruth suddenly realized that her companion was grieving. Being a woman of direct action, her mouth was open before her mind was fully engaged. “Boyfriends are tough,” she said. The farmyard was empty, and Ruth’s heart sank. This wasn’t going well at all. But then she heard hammering and talking and laughing in the distance. “What was her name, your friend, that is?” Suzanna asked as she opened the Jeep’s door. “Yeah, unfortunately. He turned out to be as dumb as I thought he was. Left her with two kids and a mortgage and a junk car,” Ruth said. Suddenly Faye’s brother Wil appeared in the barn door, and Suzanna’s head came up, a smile hovering in the corners of her mouth. Wil waved, and halloed, beckoning them closer. As Ruth watched, Suzanna reacted like a dry plant getting water. Suddenly, Suzanna whirled around, and hugged the older woman. “You know, you were my first friend when I came to Carding, and I’ve never forgotten that. Thank you,” she said. And then she was gone.